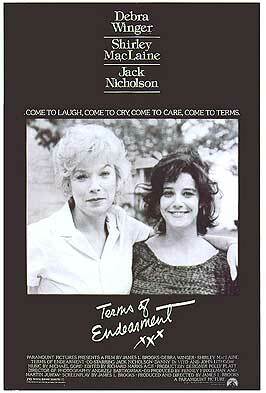 Terms of Endearment (1983): Written and directed by James L. Brooks. Based upon the novel of the same name by Larry McMurtry. Starring: Debra Winger, Shirley MacLaine, Jack Nicholson, Jeff Daniels, and John Lithgow. Rated R for language ans suggestive themes. Running time: 132 minutes. Ah yes, we’ve reached the so-called “chick flick” of the Oscar bunch with James L. Brooks’s seminal tearjerker. I see that term (and its derogatory connotations) as rather irrelevant here—my opinion stems not from the film’s label but the film itself. Brooks attempts to explore the inner lives of a mother and daughter as they struggle with love and hardship down through the years. Aurora Greenway and her daughter Emma have nurtured a love-hate relationship since Emma’s birth. The film follows their stories in parallel fashion as we see Emma’s strained marriage to the wishy-washy Flap Horton, along with Aurora’s courting of the next door neighbor, former astronaut Garrett Breedlove. Each women becomes privy to the others’ secrets, as they continually rediscover themselves. Brooks gives a story with fairly humble trappings an almost epic feel, a trait I greatly admire. Yet I often felt at a distance from his characters, part of which may have something to do with their translation from page to screen—Brooks often lets time mark the changes in their relationships. Still, the writing is clever and insightful, when not trying too hard for profundities. Terms benefits most from its strong cast, with Shirley MacLaine (who would win an Oscar) as the widowed mother and an equally strong Debra Winger as the flawed but resilient daughter. The two of them exude an easy chemistry as they oscillate between affection and animosity. Jack Nicholson remains magnetic on screen—he’s playing classic Jack, in all his impish charm and oddball mannerisms. He’s the perfect foil to Aurora’s cold matriarch. I understand the praise heaped upon Terms, but it left me feeling somewhat empty. The film doesn’t quite strike a balance between naturalism and mannered comedy that the subject matter requires. At least it showed that the Academy could honor films of this kind.